What’s your name and what year of study are you in? My name is Ellen Conway and I’m currently a third year student in WIT. I’m doing my internship in Routematch but I am also involved with Crystal Valley Tech. Did you have an opportunity to relocate for your Internship? Why did you decide to stay in the South-East? Yes, my college course offers a flexible semester which means I could have went to study or work abroad on the Erasmus program. I decided to stay and do an internship as it would give me great experience for the future and I could stay close to home which meant I could keep my part-time job too. I was offered my placement in Kilkenny and Kerry but when I was offered a job in Routematch, I jumped at the chance to work in such a fantastic company. Tell me a bit about your internship? I am interning in Routematch. Routematch is a leading software provider of passenger transportation technologies. They are committed to fostering new ground- breaking technologies and partnerships that support solutions, choices, promises and connections for all. 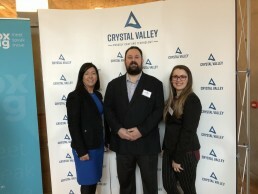 Crystal Valley Tech is a South-East Tech hub. It’s mission is to Promote and Support Tech in Waterford and the South East. In addition to influencing Local / Regional and National Policies – they plan to have working groups that will support our mission. They host regular events that will cultivate a Tech Community that everyone will benefit from. My main roles included researching content for CVT’s social media platforms, developing and updating CVT’s website, running CVT’s informative email campaigns but also attending and organising events run by CVT for its members, to name just a few. The opportunity to see CVT grow from the ground up and meet such amazing people has been phenomenal and it is an invaluable experience for my progression in my future career. From a Routematch perspective, I was given the chance to assist the Office manager in a number of different admin tasks which gave me and insight into all the finer details that are required to run a quickly growing office. I must mention that I do not have a tech background and to be honest, before starting placement, I thought that a tech company was solely working with computers and lines of code on a screen which scared the life out of me. I now know that all the jobs are not just computer based and that there are so many opportunities for other disciplines. What surprised you most about CVT? I was surprised when I found out that there is actually over 75 tech companies in the South- East which is so much more than I originally thought. This is a priceless piece of information that I feel more people need to know about as it means that people no longer have to leave the region to get great jobs because they are already available for them here. Proof of that is the fact that in the coming few months, over 300 jobs have been confirmed as being available in various CVT member’s companies. From working closely with these companies for the last few months, the overwhelming sense of community between these tech companies is amazing. To see their ability to pitch in when needed while also being able to show a huge amount of support to other member companies by attending one another’s events and actively following each other on social media, truly makes me want to be a part of this fantastic community. Has working for a Tech Company/ CVT Member company in your home town changed your career prospects? It definitely has changed my career prospects as I originally thought in order to get a good job I would have to move away from the South East to the likes of Dublin or England but now I know that there is an amble number of opportunities for me right on my doorstep. I have also realised that just because I have no tech background, doesn’t mean that I can’t work in a tech company. My background is marketing but with the way digital marketing is becoming more widely used as a company’s main way of marketing, this creates endless opportunities for myself regardless of the sector a company is operating in. My name is Daniel Connolly and I am a third year student in WIT, doing BBS with a specialisation in marketing. I am doing my Internship in Sedicii, which is based in the ArcLabs. I was offered the opportunity of applying for positions in places such as Dublin and Kilkenny, however I am a home bird and love Waterford and I also really wanted the opportunity to work within a start up and most preferably one in the ArcLabs as I have always had a huge interest in enterprise and entrepreneurship. 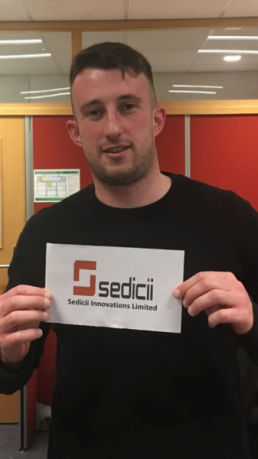 I felt that the ArcLabs is the heart of innovation and enterprise in Waterford, so when I was offered a position within Sedicii I immediately took the opportunity. I am working in a company called Sedicii, in short Sedicii has developed and patented a technology based on the Zero Knowledge Proof Protocol that eliminates the transmission, storage and exposure of private user data during authentication or identity verification, which reduces identity theft, impersonation and any fraud resulting from the identity theft. My role within the company was mainly to assist Fidelma Connors our marketing manager with any tasks she needed me to do such as finding and creating content for our social media platforms, creating social media pages, proof reading white papers the company was preparing, photoshopping elements of different documents and PDF’s, attending CVT events and researching various things. I personally do not have a background in the tech industry, but I have seen first-hand from working in a tech company that there is ample amount of employment opportunities across various disciplines within any tech company and its not all coding or computer-based jobs. From attending some of the CVT events I have been able to see firstly the amount of tech companies operating within the area, which came as a surprise as I knew there were tech companies in Waterford but I did not realise there were as many as there is, along with also seeing the great work they are doing promoting Waterford as a tech hub and ensuring that all tech businesses in the area work together for their mutual benefit. I have also seen through CVT’s regular social media updates on business members activities, the countless stories of Waterford businesses which have grown massively in the last number of years. These companies are often assisted by not only the CVT group but also by the likes of enterprise Ireland with things such as grant funding, mentoring and also sometimes office space in the ArcLabs which acts as an incubation centre for Start Up companies. All the events that have been organised to date were excellently coordinated and really showcased what is to offer in the south east and the thriving tech industry that a lot of people don’t really realise exists. The sheer amount of tech companies is also another surprise, I knew that the ArcLabs existed and there was a lot of companies out here, but when you see them all together in the Crystal Valley Brochure it really puts in to perspective how many there are and the amount of innovation and enterprise there is in Waterford. I think working with Sedicii (Tech Company/CVT member) has improved my career prospects in some aspects as I have definitely gained a lot of insights into a growing industry (the Identity and Privacy industry) which will definitely be an asset if I was to pursue a job in the same industry in the future, as well as meeting a lot of new people who work within CVT tech businesses who may possibly be helpful contacts in the future when trying to pursue a career path in Waterford or maybe even further afield.